﻿ The first S22E roller plough in the UK. 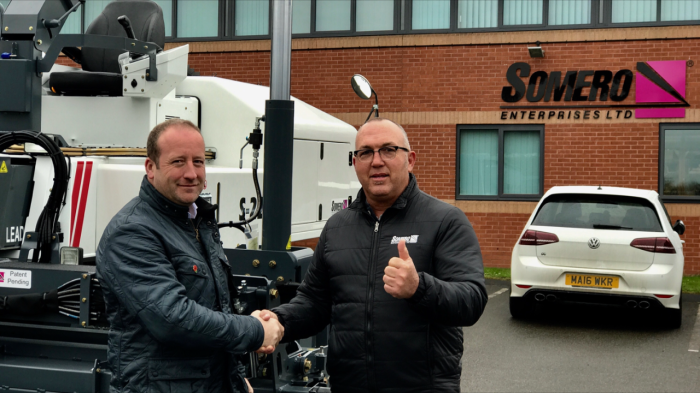 Nationwide Concrete Flooring Ltd are proud to announce the arrival of another huge investment from Somero USA, the first S22E complete with roller plough to be bought and used here in the United Kingdom. Allan Bamforth of Nationwide was handed the new purchase by Matthew Bennett the Vice President of European, Indian, Russia, and the Middle East sales at Somero’s U.K. Offices in Chesterfield. Matthew wanted to congratulate and thank Allan and the team at Nationwide on the purchase but also go through some of the latest features on the Somero machine making it the best in the world! The new acquisition will be livered in the usual Nationwide colours shortly and sent out to work next week on up and coming projects laying quality, flat industrial concrete floors. Or call our office on 01405 704722 we are here to help.